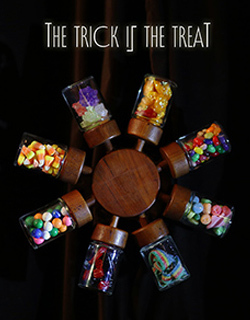 I’ve got a brand new psychedelic super-short up on ShockTillYouDrop, called THE TRICK IS THE TREAT. It’s a candy-pail odyssey, filled with vintage plastic pumpkin buckets and more sweets than can possibly be healthy. Here’s the isolated score track, a minimal Carpenter/Howarth inspired piece. Please enjoy LOUD and IN THE DARK….! OMG WHAT A FANTASTIC SHORT. I enjoyed this sooo thoroughly. What caught my attention at first was of course the mention that Angus Scrimm is the narrator — after having listened to him on loop say “BOOOOY” from Phantasm, this had me curious. The repetition by the young boy voice further enhanced the atmosphere. I got a definitely bridging of horror eras from this short, like the 70s to now with the pixelation ice cream effect. The typography is intriguing as well, that shadowplay between light and sound. This ticking minimal score added just the right amount of — ahem — flavor to the proceedings. Overall, what a superb vibe. How did you get Angus to join your project? Thanks Torley! Angus has been in a few films that I’ve worked on (I SELL THE DEAD, SATAN HATES YOU, AUTOMATONS), and a radio play that I directed – he’s a national treasure as far as I’m concerned! Graham, “national treasure” is a perfectly apt term. Now I have to check more of your craft out, you’ve got a gift for sight AND sound that I can appreciate!